Original sixth-plate (1/6) ambrotype, on colored glass... Young soldier in frock coat with painted gold buttons. His hand is visible underneath the dog's chin, turning his face to the camera, and a couple of painted gold rings are visible. Double matted in full case. The ambrotype is in excellent undamaged condition. The mark by the curtain is on the outside of the glass. The case is also in excellent condition with no repairs. 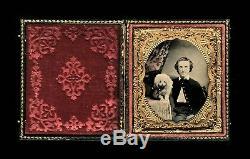 The item "1860s Ambrotype Photo Young Civil War Soldier with Poodle DOG A Rare shot" is in sale since Sunday, November 11, 2018. This item is in the category "Collectibles\Photographic Images\Vintage & Antique (Pre-1940)\Daguerreotypes". The seller is "jack_mord" and is located in Woodinville, Washington.